11/22/2017 Happy Thanksgiving, Strikers! To celebrate this festive season, we have Azure Striker Gunvolt AND both Gunvolt soundtracks available on the Steam Autumn Sale for 60% off! 29th Feb 2016 "Steam Ver. Page"Update! 29th Jan 2016 "Steam Ver. Page"Update! 26th Dec 2015 "Steam Ver. Page"Update! 27th Nov 2015 "Steam Ver. Page"Update! 30th Oct 2015 "Steam Ver. Page"Update! 30th Sept 2015 "Steam Ver. Page"Update! 21th Aug 2015 "Steam Ver. Page! 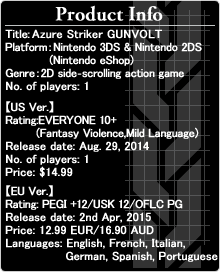 Azure Striker Gunvolt has been added. We have a special 'Hanami' wallpaper for you! We have a special Springtime wallpaper for you! 5th Mar 2015 "Ver. 1.2 Information Sheet"Update! We have a special Valentine'sDay wallpaper for you! We have a special brand new holiday wallpaper for you! We have a special Christmas wallpaper for you! We have a special Thanksgiving wallpaper for you! We have a special Halloween wallpaper for you! 25th Aug 2014 "CHARACTER"sections updated. sections updated.New Characters, System information, product information added. 7th April 2014 Official english website opening.